Anyone who has been through a high school science class will likely be familiar with the term osmosis. A French scientist first described the process in 1748, who noted that water spontaneously diffused through a pig bladder membrane into alcohol. Over 200 years later, a modification of this process known as reverse osmosis allows people throughout the world to affordably convert undesirable water into water that is virtually free of any contaminants. Reverse osmosis systems can be found providing treated water from the kitchen counter in a private residence to installations used in manned spacecraft. The reverse osmosis method of drinking water treatment has long been regarded as one of the most efficient ways to reduce impurities. It is the technology we have used to build the OSMOSIS WATER SYSTEM. So if you want to give your family healthy, deliciously crystal clear drinking water, there is no better system than REVERSE OSMOSIS. A semi-permeable membrane like the membrane of a cell wall or a bladder, is selective about what it allows to pass through, and what it prevents from passing. These membranes in general pass water very easily because of its small molecular size; but also prevent many other contaminants from passing by trapping them. Water will typically be present on both sides of the membrane, with each side having a different concentration of dissolved minerals. Since water is the less concentrated solution, it seeks to dilute the more concentrated solution, water will pass through the membrane from the lower concentration side to the greater concentration side. Eventually osmotic pressure, (seen in the diagram bellow as the pressure created by the difference in water levels) will counter the diffusion process exactly and an equilibrium will form. The process of reverse osmosis forces water with a greater concentration of contaminants (the source water) into a tank containing water with an extremely low concentration of contaminants (the processed water). High water pressure on the source side is used to reverse the natural osmotic process, with the semi-permeable membrane still permitting the passage of water while rejecting most of the other contaminants. The specific process through which this occurs is called ion exclusion, in which a concentration of ions at the membrane surface form a barrier that allows other water molecules to pass through while excluding most substances. What does Reverse Osmosis treat? Reverse osmosis treats a wide variety of health and aesthetic contaminants. Effectively designed, RO equipment can treat for a wide variety of aesthetic contaminants that cause unpleasant taste, colour and odour problems like a salty or soda taste caused by chlorides or sulfates. RO can also be effective for treating health contaminants like arsenic, asbestos, atrazine (herbicides/pesticides), fluoride, lead, mercury, nitrate and radium. When using appropriate carbon prefiltering (commonly included with most RO systems), additional treatment can also be provided for such "volatile" contaminants as benzene, trichloroethylene, trihalomethanes and radon. Some RO equipment is also capable of treating biological contaminants like Cryptospordium. The Water Quality Association (WQA) cautions, however, that that while RO membranes typically remove virtually all known microorganisms and most other health contaminants, design consideration may prevent a unit from offering fool proof protection when incorporated into a consumer drinking water system. When looking for a product to treat for a given health contaminant, care should be used to find products that have been tested successfully for such purposes at a quality testing laboratory. Semipermeable membranes have come a long way from the natural pig bladders used in the earlier osmosis experiments. Before the 1960'S these membranes were too inefficient, expensive, and unreliable for practical applications outside the laboratory. Modern advances in synthetic materials have generally solved these problems, allowing membranes to become highly efficient at rejecting contaminants, and making them tough enough to withstand the greater pressures necessary for efficient operation. 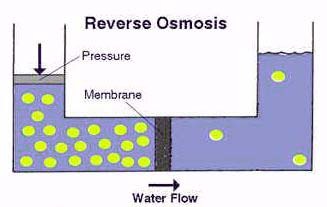 Even with these advances, the "reject" water on the source side of a reverse osmosis (RO) system must be periodically flushed in order to keep it from becoming so concentrated that it forms a scale on the membrane itself. RO system also typically require a carbon prefilter for the reduction of chlorine, which can damage an RO membrane; and a sediment prefilter is always required to ensure that fine suspended materials in the source water do not permanently clog the membrane. Hardness reduction, either through the use of water softening for residential units or chemical softening for industrial use, may also be desirable in hard water areas. A low pressure RO system generally refers to the system with water pressure of less than 100 psi. 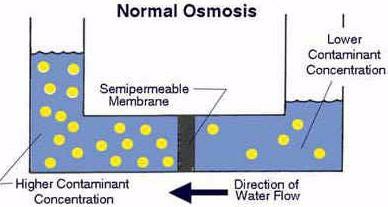 These are the typical countertop or undersink residential systems that rely primarily on the natural water pressure to make the reverse osmosis process function; a typical system is shown schematically. Countertop units typically have an unpressurized storage tank. Undersink units typically have a pressurized accumulator storage tank where the water pressure tends to increase as the tank fills. This pressurized system provides sufficient pressure to move the water from the undersink storage tank to the faucet. Unfortunately, this also creates a backpressure against the membrane, which can decrease its efficiency. The Reverse Osmosis System connects to the cold water supply under the sink. First, water passes through at a 5/10 micron SEDIMENT FILTER, which removes large particles that float in the water like silt, sand, rust, dirt, etc. We can see down to 40 microns (A human hair is about 80 microns and most bacteria is around 1 micron). This filter should be changed as needed by visually looking at it (typically 6 months to 1 year). Second, the water passes through a BITUMINOUS GRANULATED COAL FILTER that removes chlorine, some pesticides, herbicides and toxic chemicals. This filter should be changed every 6 months religiously. Both of the first two filters main purpose is to protect the RO membrane from chlorine and particles that can prematurely ruin the membrane. The RO MEMBRANE is the heart of the system. It filters down to a molecular level (1/10,000/micron). Water is basically forced through the membrane. The water that makes it through is the purified water and the water that doesn't make it is impure water and it is dumped down the drain. The water slows down to a drop at a time and is accumulated in a 3 gallon pressurized storage tank. The water is then pushed out of the tank at about 40-60 psi through a 10 inch post coconut shell carbon filter designed to pick up anything missed by the previous filters insuring great taste on the way to the faucet. The faucet is an air gap faucet and meets all plumbing codes. Low pressure units typically provide between 24 and 35 gallons per day of water. Water purity can be as high as 95 % of rejection. These systems can be highly affordable. These units produce water for a cost as low as five cents per gallon once maintenance and water costs are factored in. Maintenance usually requires replacing any pre-or postfilters (typically 1 to 2 times per year); and the reverse osmosis cartridge once every two to three years, depending on usage. Contact Rosmosis for further product information info@rosmosis.com. Certified sales representatives and certified installers will advise you on your water needs and equipment installation.